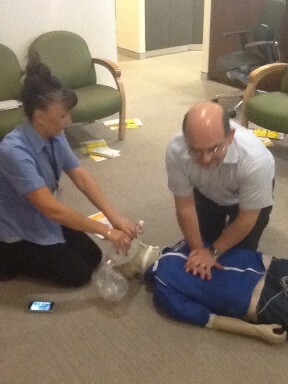 Its that time of year again When Dr Seymour and myself shuffled off to up date our First Aid and CPR skills. As with everything in life things change and so did a few things since our last coarse, we were advised of updated medical equipment being used also more on (anaphylaxis) and the new Epi pen that has been brought out and also the fact that CPR no longer requires you to give rescue breaths. Today I will give you a brief explanation on how CPR is done. Hands-only CPR, which is also known as compression-only CPR, because it does NOT involve rescue breathes. If you see someone collapses, posture them flat. If they do not recover after lying them flat, check their response by tapping the person with the back of the hand on their cheek and asking if he or she is alright. “Are you okay? Can you hear me?”. If there’s no response and the person does not appear to be moving or breathing immediately, or the breathes are less than 5-6 breaths per minutes, have your team or workers dial 000 and call for an ambulance and start your compressions straight away. Place the palm of your hand directly on the center of the chest, lock your fingers together, keep your elbows and your arms straight, press straight down on the midline and centre of the chest on the sternum bone, doing at least 100 compressions-per-minute, going at least two inches down with each compression. Continue your compressions hard and fast over and over again and if you get tired swap with another person but continue until help arrives or someone who is more qualified can take over. These simple steps are going to be the best way to give your loved one or someone else’s loved one the best chance of survival. As we have a barrier device called a hand held ventilator, then the patient is laid flat. Extend the head & the airway is cleared. A tube is used to insert into the airway to keep it open and the air bag attached. Then at every 30 compressions are completed, 2 ventilations are preformed. The most important aspect of CPR is to keep the blood circulating in the coronary arteries to keep the heart muscle alive. To ensure that blood circulates to the brain. Vinnie Jones - Hard and fast and staying alive CPR. Scroll down to play video. Roni on hand ventilator and Dr Seymour doing compressions on George!